Ein einflussreicher US-Spieler zerreißt die Uran-Firma und fährt auf der Short-Seite massive Gewinne ein. "..We expect the stock price to drop by more than a buck, down to $1.50. * Important Disclosure: The owners of TheStreetSweeper hold a short position in UEC and stand to profit on any future declines in the stock price.."
Uranium Energy looks ready to do just that to investors. The company has not responded to TheStreetSweeper’s request for comment but investors may find other viewpoints here. Meanwhile, we’ve leaned on some ol’ country songs to help us croon out the risks. While UEC stock is up, the company’s peers are all down. The reason the sector’s performance remains so terrible is because uranium spot prices of about $36 are at a five-year low, as shown below. So these factors indicate that UEC’s recent price performance is unsustainable because the fundamentals of the company (more on that below) and the sector have not improved. 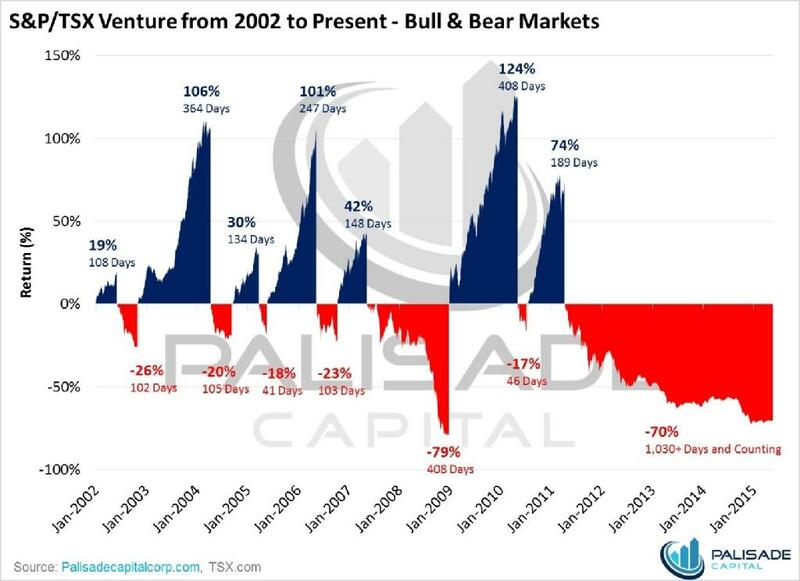 We expect the stock will collapse as it follows the path set by peers. UEC reports zero sales in the past seven quarters from its sole producer, the Palangana Mine. So the company is not even operating, as shown here. The reason UEC was able to boost its cash recently is simply because it sold $3 million worth of uranium held in inventory. The company sold 80,000 pounds of finished uranium. But they blew almost the entire wad. The excerpt from SEC filings, here, shows that only 4,000 pounds remain in inventory. So, while the $3 million sale helped, the party’s over. Even if the company sold every last remaining ounce at $38 per pound (2 bucks above today’s price), it would mean only about $152,000 to UEC. That’s nothing, especially to a company that is sitting on its last few bucks and currently has no way to generate revenue. *”Kick The Dust Up,” And The Hype, Too! UEC has been running up on promotions coming from Twitter, Seeking Alpha authors and reportedly hype paid by the company itself. Additionally, insider buying has served as a promotional tool. But investors shouldn’t be thrown off by the CEO, who earns $640,000, making a small 34,000-share stock purchase. 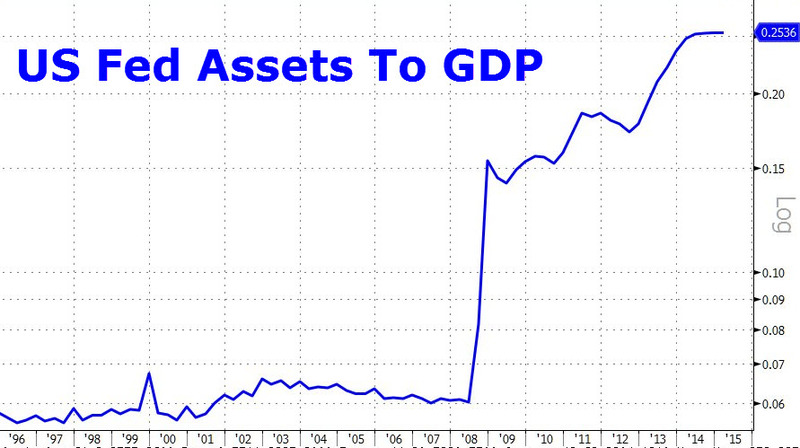 We contend it’s window dressing …. A little more come hither. With no uranium production, UEC stock has rallied due to the inventory sale, some Japanese nuclear restart news and the small insider purchase – despite the fundamental shift in the uranium industry. UEC has always lost money, has significant negative cash flow, has yet to achieve profitability and is struggling to operate as a going concern. It really all comes down to this: The company is poor - down to about $6 million working capital as it burns about $4 million per quarter even in its current non-productive condition. We expect UEC would have to see if and when uranium prices reach $45 to $50 per pound before it could justify restarting operations. In that event, an analyst estimates it would take two quarters and another $10 million or so per quarter simply to prep the mine. We expect the stock price to drop by more than a buck, down to $1.50. * Important Disclosure: The owners of TheStreetSweeper hold a short position in UEC and stand to profit on any future declines in the stock price. Editor's Note: As a matter of policy, TheStreetSweeper prohibits members of its editorial team from taking financial positions in the companies that they cover. To contact Sonya Colberg, the author of this story, please send an email to editor@thestreetsweeper.org or scolberg@thestreetsweeper.org..
Neues Interview mit Kupfer-Experte Gianni Kovacevic: "Die Zukunft der Energie ist die Elektrizität"
"..Gianni Kovacevic joins Cambridge House Live anchor Vanessa Collette to discuss the demand for copper, copper development projects, China and India's causing robust demand for copper, the energy complex and where it's going, the green metals including platinum & palladium, his current investment strategy, and his newest venture Copperbank..."
Der Gold-Junior einigt sich mit dem erfolgreichen und etablierten Goldproduzenten Lake Shore Gold (TSX:LSG) auf einen attraktiven Deal und erhält zudem noch eine ansehnliche Kapitalspritze von Delbrook Capital aus Vancouver, die am aktuellen PP teilnehmen werden. Das sind starke Fortschritte in einem extrem herausfordernden Umfeld für Junior-Miner wie die klein kapitalisierte IDM! IDM Mining Ltd. (TSX:IDM) ("IDM" or the "Company") is pleased to announce that Delbrook Capital Advisors Inc. ("Delbrook") and Lake Shore Gold Corp. ("Lake Shore") have committed to invest a combined total of $1.4 million in Common Share Units and Flow-Through Units under the Private Placement previously announced by the Company on May 19, 2015 (the "Private Placement"). As a result of these major investments, IDM will increase the size of the Private Placement to raise aggregate gross proceeds of up to $2.5 million (see below - Private Placement). In addition, IDM has entered into an agreement (the "Letter Agreement") with Lake Shore to amend a Purchase and Sale Agreement dated January 2013 (the "PSA") relating to the acquisition of certain legacy properties located in Mexico. On completion of the transactions contemplated under the Letter Agreement, IDM will eliminate its future financial obligation to Lake Shore and significantly improve its financial position. 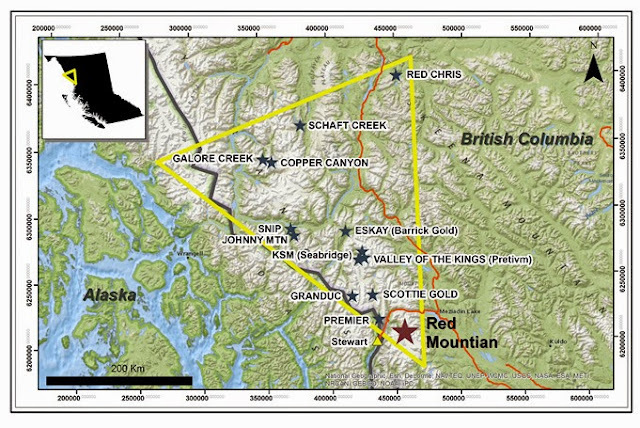 Both the Delbrook and Lake Shore investments and the Letter Agreement represent major positive steps forward for IDM, and will help to position the Company for success as it advances its high-grade advanced stage Red Mountain gold project in BC. 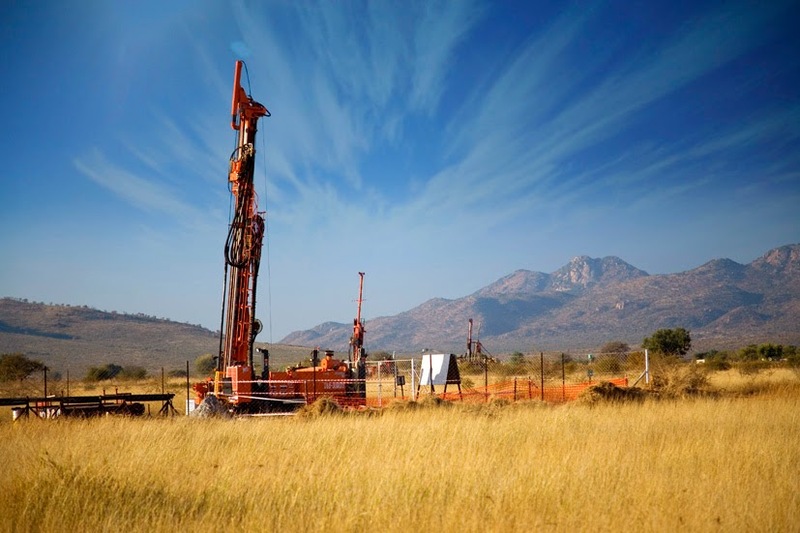 "The significant investment from Delbrook will allow IDM to advance permitting and exploration this season," stated Michael McPhie, the Company's Executive Chairman. "We are also very pleased to have reached an agreement with Lake Shore and to welcome them as an investor. 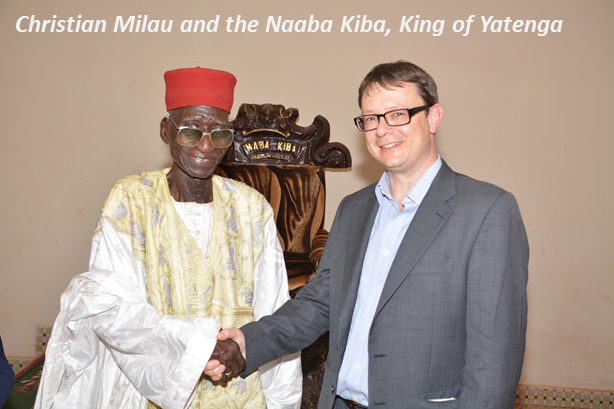 We are particularly pleased both groups share our excitement and vision for the potential of Red Mountain." "Over the past year the Company has been working diligently to resolve historical liabilities and adapt our business plan to the current market environment. Today's announcement is a step forward in executing on these objectives. This is a pivotal time for the Company as it advances the Red Mountain project through the permitting process and towards a construction decision. 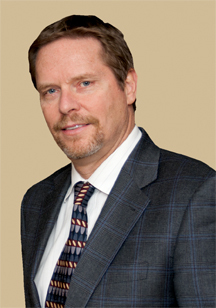 We look forward to working with Delbrook and Lake Shore as major shareholders." 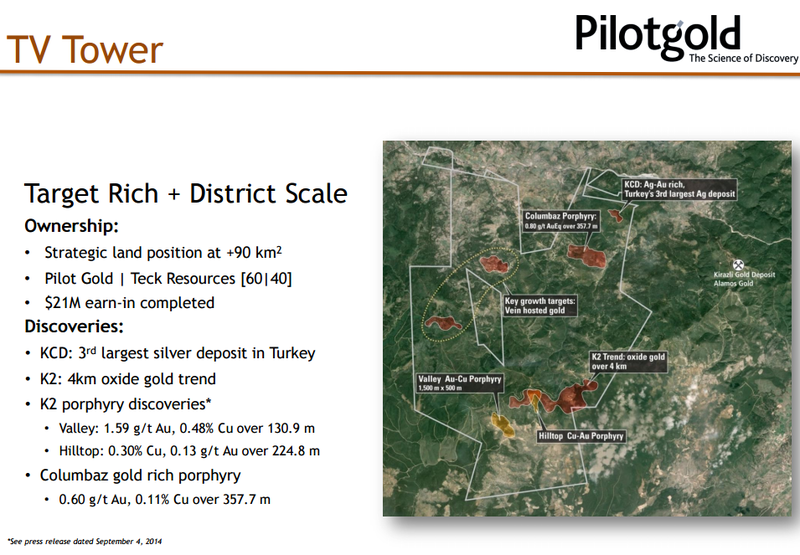 Pilot Gold (TSX:PLG) startet das heiß erwartete 2015er Explorations- & Drilling-Programm auf TV Tower in der Türkei, welches in einem aktiven Joint-Venture (60/40) mit dem Rohstoffgiganten Teck Resources (NYE:TCK) exploriert und weiterentwickelt wird..
VANCOUVER, BRITISH COLUMBIA--(Marketwired - June 17, 2015) - Pilot Gold Inc. (TSX:PLG) ("Pilot Gold" or the "Company") is pleased to report the start of drilling at the Company's 60%-owned TV Tower property in northwestern Turkey. Drilling started on June 13, and will be focused on advancing and delineating district scale copper-gold porphyry systems. A budget of $6.0 million with over 20,000 metres of diamond drilling is planned and funded pro-rata through a joint venture between Pilot Gold (60%) and Teck Madencilik Sanayi Ticaret A.S. (40%), a Turkish subsidiary of Teck Resources Limited ("Teck"). "2014 saw tremendous success at TV Tower with the discovery of the Valley and Columbaz porphyries and growth of the mineralized footprint at the Hilltop porphyry," said Matt Lennox-King, President and CEO of Pilot Gold. 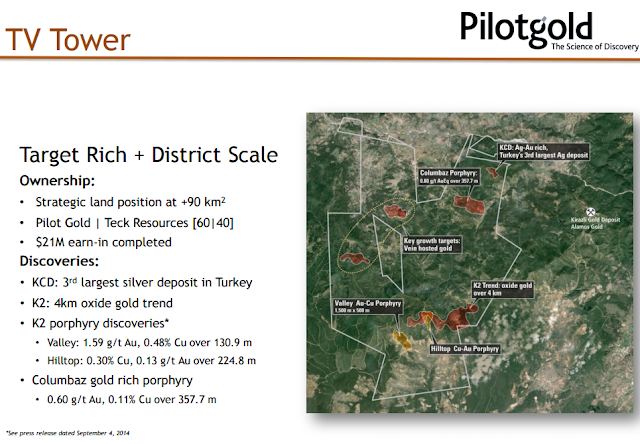 "We believe these discoveries are only the first porphyries at TV Tower and we remain focused on driving district scale growth through additional discoveries in this rapidly evolving mineral belt. With our PEA-stage Halilaga copper-gold project 15 km away, we see tremendous potential for continued growth and consolidation across the district." The 2015 program is designed to build on the discovery of the Valley porphyry, focused on expanding the footprint of mineralization and testing high priority step out targets. The Company has recently completed preliminary metallurgical testing on material from the Valley porphyry, and will continue with property-wide environmental baseline studies and comprehensive CSR programs. Of particular focus in 2015 is the K2 zone which hosts the Valley and Hilltop copper-gold porphyries and extensive oxide gold potential. Targets at K2 are marked by outcropping high grades in gold and copper, on a large (1.5km long) copper-in-soil footprint. Recent geophysical studies revealed a large IP target immediately southeast and on trend with the Valley discovery. 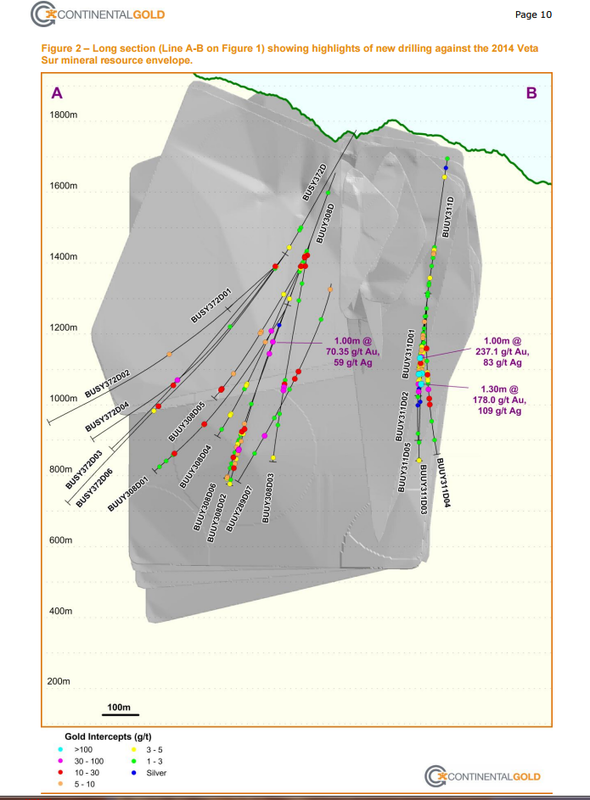 Limited exploration drilling has been completed at K2 but initial 2014 results demonstrate the potential for a significant mineralized endowment. TV Tower encompasses 92 square kilometres in the heart of an emerging mineral district in northwest Turkey. It contains a large number of targets ranging from high- and low-sulphidation epithermal gold-silver to porphyry gold-copper. 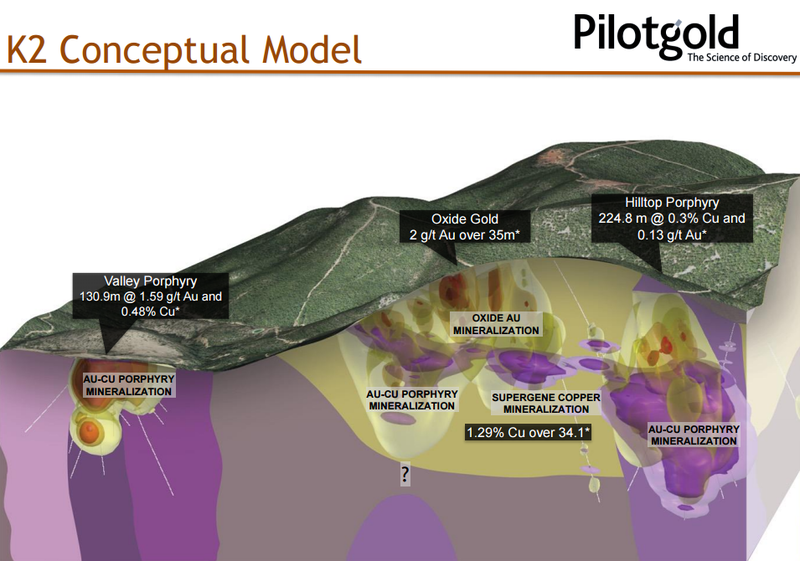 Pilot Gold has advanced five significant gold, silver and copper-gold discoveries on the project over the past four years. The property hosts numerous additional untested gold and copper targets. The project has an extensive road network and targets to date all lie on land administered by Turkey's Ministry of Forestry. The project is road-accessible and is located in a region featuring advanced stage gold and copper-gold projects, numerous open pit coal, quartz and clay mines, ceramics factories and a major power plant. 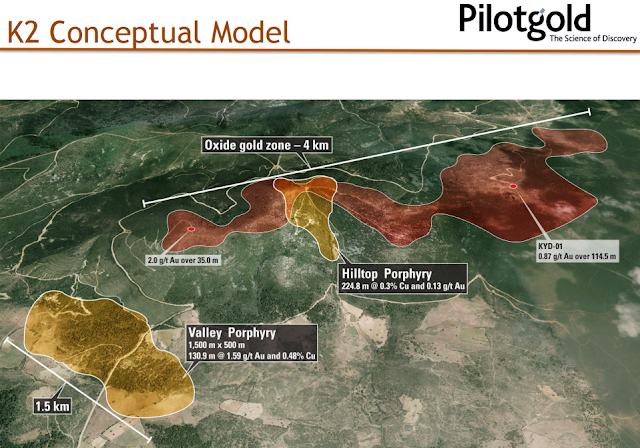 It is located immediately west of the Kirazli gold project (Alamos Gold) and approximately 15 kilometres northwest of the Halilaga copper-gold project (Teck/Pilot Gold)..
Der sehr solide aufgestellte Explorer und Projekt-Entwickler Pilot Gold (TSX:PLG) legt heute eine ausgezeichnete, vorläufige Wirtschaftlichkeits-Schätzung (PEA) für das Halilaga Kupfer- und Gold-Projekt in der Türkei vor.. True Gold Mining (TSX-V:TGM) verkündet heute weitere positive Nachrichten. Die Konstruktion auf dem Weltklasse Karma-Goldprojekt in Burkina Faso wurde Anfang Juni wieder erfolgreich aufgenommen. Zudem erzielt der angehende Goldproduzent einen sehr wichtigen Deal mit den lokalen Communities inkl. 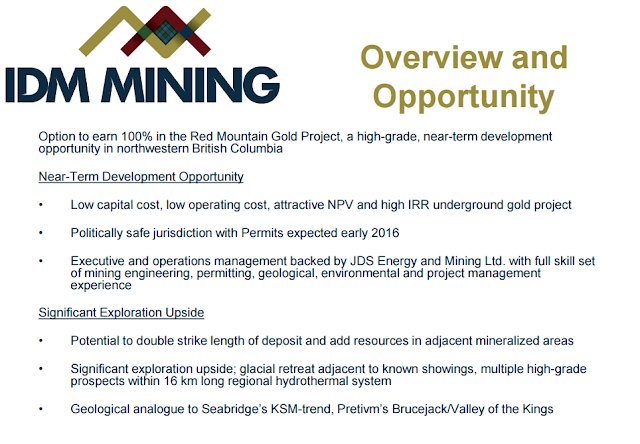 dem lokalen Religions-Führer..
VANCOUVER, BRITISH COLUMBIA--(Marketwired - June 17, 2015) - True Gold Mining Inc. (TSX VENTURE:TGM) ("True Gold" or the "Company") today provided a general corporate update on the construction of its Karma Gold Project ("Karma" or the "Project") in Burkina Faso. Construction activities and local procurement have ramped up and we are on schedule for first gold pour by the end of Q1-2016. With over 250 staff onsite, we are underway with excavation of the storm and raw water ponds as well as site preparation for the heap-leach pad. Christian Milau, True Gold's CEO commented, "I am extremely pleased with the speed and efficiency our team has demonstrated in getting back to work since mid-May. 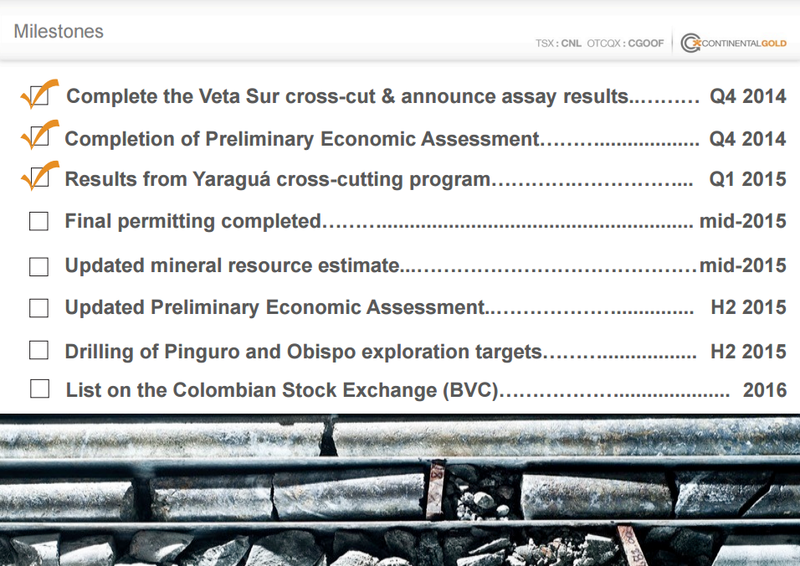 Over the last few weeks we have made significant progress towards first gold pour. The site is buzzing with energy and excitement of being back at work and I want to thank our team for their dedication and diligence in getting Karma back on track. The local communities, suppliers, and the government, have been extremely supportive of the return to work." To view the latest photos of construction efforts at Karma please click here: http://truegoldmining.com/our-projects/karma-project#field-project-tab-tab-7X. 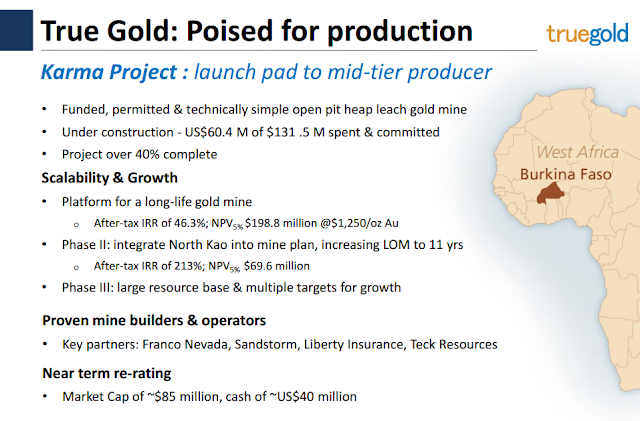 The project remains funded to complete construction and is on schedule for first gold pour by the end of the first quarter of 2016. 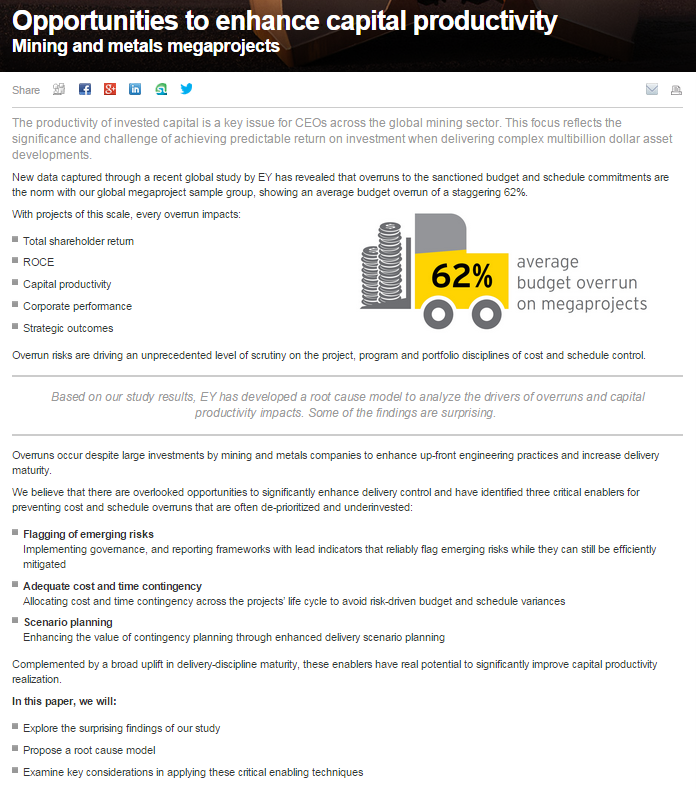 As of May 31, 2015, True Gold estimates that capital expenditures to projected initial production are approximately $70 million. The Company has approximately $29 million in cash and cash equivalents, with $63 million available under the Franco-Nevada - Sandstorm Gold Financing Agreement. Out of control - crazy..
(Reuters) - Democratic Republic of Congo said on Tuesday that Ivanhoe Mines' sale of a stake in the Kamoa copper mine to China's Zijin Mining should be suspended until concerns raised by the government can be resolved. Vancouver-based Ivanhoe announced last month that it would sell a 49.5 percent stake in Ivanhoe subsidiary Kamoa Holding Ltd to China's Zijin Mining Group Co Ltd for $412 million.. 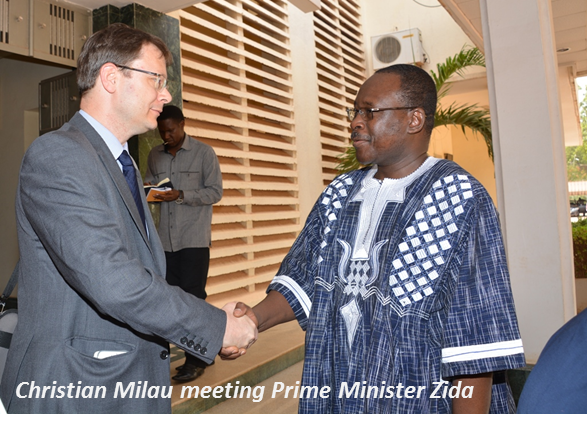 "..The government also vowed to reevaluate the Kamoa mine's legal status in Congo.."
BIG DEAL für Afrika-Pionier und Mammut-Developer Ivanhoe Mines (TSX:IVN) in der DRC.. Die Continental-Aktie konnte in den letzten 8 Wochen bereits einen Teil ihrer fundamentalen Unterbewertung (vgl. Peer Group Goldminenbranche) wettmachen, hat jedoch auch weiterhin gewaltiges (Out-)Performance-Potential.. These intercepts are interpreted to represent extensions of the northern Veta Sur vein families, covering a range of elevations. These vein families remain open along strike to the east at depth..
"These and other infill intercepts extend high grade sub-domains in central and southern veins in western Veta Sur. 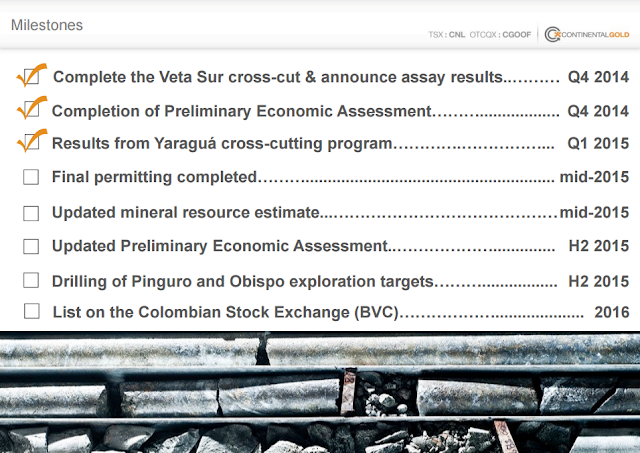 Veta Sur continues to deliver robust results and we remain confident that this will be reflected in our upcoming updated mineral resource estimate", commented Ari Sussman, President and CEO of Continental..
Bullen vs. Bären, Small Caps Kanada, TSX-Venture: 1.035 Tage Bärenmarkt und noch kein Ende in Sicht? 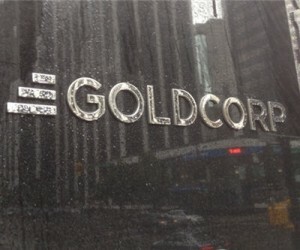 Zuerst erhöht der nach Börsenwert wertvollste Goldproduzent Goldcorp (NYE:GG) seinen Kredit-Rahmen (1.) auf 3 Mrd. USD. Dann erfolgt kurze Zeit später der Verkauf der Tahoe-Beteiligung (2. ), welcher rund 1 Mrd. CAD in die Firmenkasse spülen wird. So liegt es auf der Hand, dass der angeschlagene Gold-Major, der erst diese Woche ein neues 7-Jahrestief markierte, seine Kriegskasse auffüllt. Nach der missglückten Übernahme von Osisko Mining (Akquisition durch Yamana/Agnico) könnte Goldcorp daher in absehbarer Zeit einen neuen, signifikanten M&A Deal anstreben. Als heiße Favoriten unter den Junior-Goldfirmen gelten meines Erachtens bspw. Detour Gold (TSX:DGC), Lake Shore Gold (TSX:LSG), Kirkland Lake Gold (TSX:KGI) und Torex Gold Resources (TSX:TXG). Im Hinblick auf die bedeutende Menge an Kapital, über die Goldcorp nun verfügen wird, ist sogar ein großer M&A-Deal definitiv möglich. Hier würden u.a. Yamana Gold (NYE:AUY), New Gold (TSX:NGD) oder IAMGOLD (TSX:IMG) vermutlich in Betracht kommen; da $GG's nachvollziehbare erste Wahl, der Goldkonzern Agnico Eagle Mines (NYE:AEM), mit einer Bewertung von 6,7 Mrd. USD wahrscheinlich eine Nummer zu hoch ist; doch wer weiß.. I recently heard a great story about the safety culture that has permeated the mining industry over the past decade, with probably a bit of overkill within the major miners. At an alleged meeting between 50+ mining execs from each side of Newmont and Barrick in New York City, discussing a possible business combo, the Newmont chair of the meeting started it off with a safety share: “when walking the streets of New York, make sure you put your blackberries away, since you might step in to the street and get hit by a car”. Getting struck and killed while walking and trolling Facebook is a risk that transects all industries, but particular to the mining industry, there are no shortage of ways to meet your maker in mining or exploration. Oh, and the Newmont-Barrick merger didn’t happen..! Wie erwartet kann NovaCopper (TSX:NCQ) in Kürze den Übernahme-Deal finalisieren. Währenddessen füllt Electrum, der Großaktionär von Nova und Sunward, seine Kriegskasse weiter auf.. The acquisition of Sunward Resources Ltd. by NovaCopper Inc. pursuant to a plan of arrangement received overwhelming approval by the shareholders of each company at their respective shareholder meetings held today. At NovaCopper's special meeting, approximately 99.36 per cent of the shares represented at the NovaCopper meeting were voted in favour of the issuance of common shares of NovaCopper in connection with the arrangement. At Sunward's special meeting, approximately 99.98 per cent of the shares represented at the Sunward meeting were voted in favour of the arrangement. Under the terms of the arrangement, each shareholder of Sunward will receive 0.3 of a NovaCopper share for each common share of Sunward held. Additional information on the results of the meeting will be filed on the SEDAR website. The arrangement is expected to be completed later this week, subject to court approval and the satisfaction of certain other customary closing conditions. Long-term, strategisch und finanziell gesehen ein genialer Deal für NovaCopper (TSX:NCQ), der nachvollziehbar den Support von den Weltklassse Aktionären wie Electrum, Gold First, John Paulson und Baupost erhält..